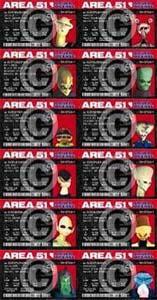 One each of the twelve (12) different Official Area 51 Alien Drivers License. Order the complete set and save! Free USA shipping on all quantities. Orders processed within 48-hours and shipped First Class mail. For additional savings we offer quantity discounts on multiple set orders. Actual size of each Alien Drivers License is 2.875" wide by 1.75" - Same size as ordinary U.S. Driver License. Bulk Price quantity is sold in groups of 12 Alien Drivers License (all differnt) makes up one unit. So if you wanted 20 sets in total, you would be buying 240 Individual Alien Drivers Licenses. Retail price per Alien Drivers License is $9.95. (this equates to only $2.50 per unit in quantity, delivered free in the USA).